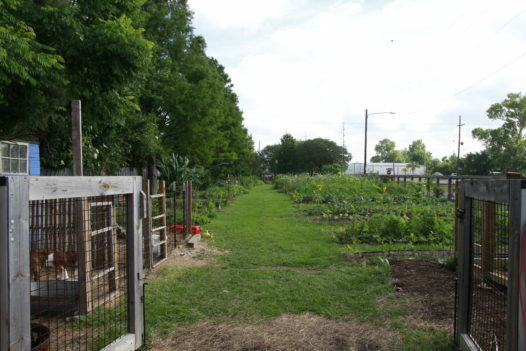 While summer in New Orleans may slow most of the city’s population down, Press Street Garden’s Manager Marguerite Green is just getting started. 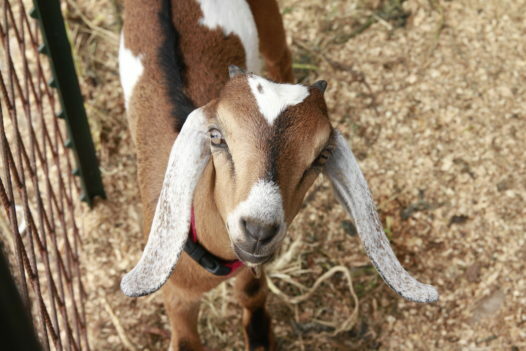 With summer crops to tend and harvest, community and educational events to plan, volunteers to manage and a family of goats and chickens to provide for, Green has plenty on her plate. And yes, I did just say a family of goats and yes, thank you for asking, they are indeed adorable. Last month, I sat down with Green to talk about her experience working at the garden and what they have coming up. Q: Well for starters, and for our listener’s sake, where are the Gardens located? MG: Yeah, absolutely! The Press Street Gardens are on the actual boundary between the Bywater and Marigny on Press St. (as the name might imply). We’re the entire block between Dauphine and Burgundy, so we’re an entire city block. It equals about half an acre all told. Q: How long have you been working there? MG: We’re entering our fourth year in the space. We didn’t break ground until about two years ago. There was an intensive planning process and we’re also in a historic district so we spent a lot of time in the permitting process as well. But we’re coming up on our second full season and really happy to be there. Q: What got you involved in the first place? MG: I was recommended to apply for the job by a friend who just thought it was right up my alley. I’ve been doing agriculture for years. 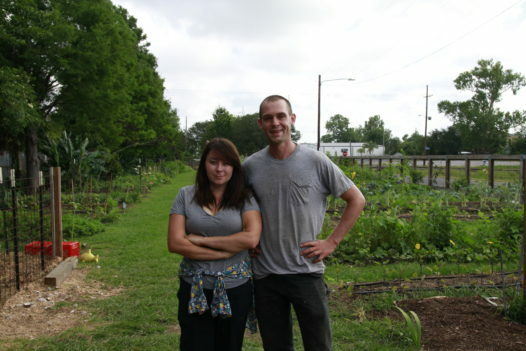 I studied agriculture at LSU and then just moved out into the world of educational farming and working with children in green spaces, which is really my favorite thing to do. Q: What are you growing and what types of animals do you have on the farm? MG: So, we’re very excited because we have two baby goats and their mother— and they’re just lovely creatures— and we have some chickens. And right now we’re transitioning into all of the summer crops. We have some tomatoes that are already producing and watermelon, cucumber, squash…we have a lot of our summer or winter greens that are sort of really on their last leg and asking to be put down. And we’re transitioning into all that good stuff, basil and eggplant too. Q: I’m really interested in the role of farm manager and I’m wondering what that entails for you? MG: Goodness! It entails really everything from answering all of the e-mails and working with volunteers, all the way to figuring out what we’re going to be planting and what we bring to market. We have two really wonderful people that also work at the gardens and it’s kind of being the person who oversees the multiple juggling tasks that have to go on at any given time. Q:A big component of Press Street Gardens is its focus on education, especially considering your partnership with the NOCCA Institute. Could you talk about that? MG: We’re essentially the school garden for NOCCA which is the New Orleans Center for Creative Arts, which is the arts conservatory high school for Louisiana students. We’re a statewide high school, but we mostly draw from New Orleans because that’s where we are. 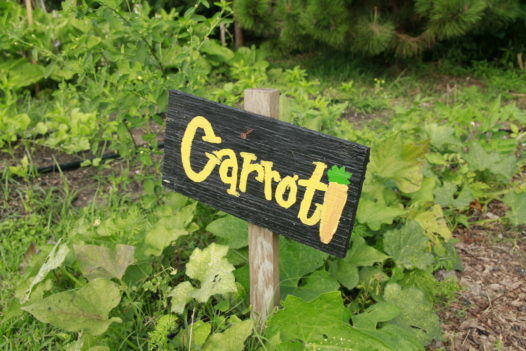 The garden is really there to enrich the learning of all of our students. As I said, we’re an arts conservatory so we have eleven disciplines, and we try to figure out creative ways for every single one of them to use the garden. We also have an academic studio component because we are a high school, so there are so many ways to integrate a garden into sciences and humanities, but I’ve always been really excited by the arts partnerships that we get to do that are really cool. We work largely with culinary arts; obviously that’s a very easy leap. We have a project where our culinary arts students are developing natural snowball flavors from the garden and we were so generously donated a snowball machine by Snow Wizard, so now we have a garden snowball stand which is like a dream. And the young people are making things like blackberry sage snowball syrup from our garden. And that’s really amazing. Then we’ve had some really interesting arts and humanities and sciences cross project where students actually design their gardens and then used whatever their discipline was to represent a gardens as they evolved throughout the history of America and food culture. Q: I’d love to hear about some of those regular events and programs that you do for the neighbors and along with the kids? MG: So we do about four parties each year (one per season) out in the garden. They’re free and open to the public and we always have a food component when school is in session [from] our culinary students who work and participate on what that food will be. But, obviously we let them have their summer when it’s summertime. And we always have some live music. Occasionally, we do a plant sale or a workshop in conjunction with those parties, but we always have multiple moving parts to them and sometimes even do like art sales for our students out in the garden so it’s more like an art market. Another really cool thing that we do is we do two workshop series a year and each series can be about eight workshops and they’re all about all different things. But we only do them in the fall and in the spring because we found that no one wants to come out after 8:00 a.m. in the middle of the summer. We always publish those and put them out into the community and they’re all free and open to the public. We have lots of really generous funders who’ve made that possible this year [including] Chevron who essentially made it possible for us to do these eight free public workshops. Q: Why do you think Press Street Garden’s space is important? MG: I think the space is important because there aren’t enough green spaces in the city where people can really understand how to interact with plants. There are a lot of unmaintained green spaces, and I think those are lovely too and I think those are really important, but there’s something nice about a green space that is more of a maintained educational garden that adults are also welcome in. We have so many school gardens that young people have access to, and I think that’s amazing and that’s something that’s obviously the biggest part of our mission. But, I love that we also are able to open our gates to adults as well and help them answer questions about the natural world around them. We have volunteer nights on Wednesday night, and I say volunteer night, but we never really aim to get much work done on Wednesday nights because it’s mostly people coming in and like patting the baby goats and asking questions like, “How long do they nurse?” and “When a chicken leaves an egg, why do you not have to refrigerate it?” So we get to have those cool conversations with adults like we’re all back in fourth grade science or something it’s really fun. Q: Another of your operations is called Cow Apple Horticulture which you are the owner and operator of. Could you tell us about that? MG: So, Cow Apple Horticulture is my personal flower farm. About six years ago I found a couple of empty properties that I was able to afford in the city, and I decided that I wanted to take a shot at flower farming. I was training in vegetable farming, but I realized kind of after college that I was very into the floral component of farming as well. And there’s also this: farmers are always struggling to make money. I mean, everywhere across the country farming is a really hard profession. The floral farming industry is cool because there’s a value added product of actually designing. So, whereas you might be selling individual floral stems for a dollar a piece, when you’re putting in design work and hours you actually get paid for those. Whereas as a farmer you don’t get paid for the hours you put in, you get paid for the food you put out. So, being able to have two trades that come together and can make a substantive living is interesting, and it was something that I found that I was passionate about. I think it’s really important because there’s so much focus on organic food in America and there’s very little focus on where your flowers come from. And I find that problematic. I really believe that people who want to shop and put their money towards organic or sustainable products should also extend to flowers. That was really important to me and I was like “I want to be part of that.” And there is a flower movement in America. We are small, but we are growing. Since starting that I ended up meeting four other women who wanted to grow (and did begin to grow) flowers and we formed the New Orleans Flower Collective together. And it’s been an incredibly enriching experience because we get to grow flowers in New Orleans and try to elevate it to a more natural [thing]. Flowers are a luxury good, but that doesn’t mean that they shouldn’t be accessible and affordable. They should be because they make people happy. Q: So what upcoming events do you have coming up soon at Press Street? MG: We are going to be having a “Fall Seed Starting Workshop” on Saturday, June 10, and that’s really important because you’ve got to get a jump to start your fall seeds so much earlier than people realize. It’s the middle of summer when you’re starting your fall seeds. So we want to give people the information on how to do that and walk them through the steps so that they have the ability and the jump to do that themselves in their gardens. So those are two of ours. And then at the end of the summer we’ll be having our Dirt Gala which is our annual dirty gala. We like to have it right in the middle of summer when no one wants to come out. We do an event with little kitty pools and our animals are out and we have all sorts of games and drinks and food and music. We don’t have a date set for that yet, but if people just keep an eye on our Facebook and follow us Facebook then we’ll have that out soon. Q: And finally, where can folks find your produce around town? MG: Well, we actually sell at the Crescent City Farmers Markets on Thursdays. That’s the one that’s at the American Can company from 3:00 PM to 7:00 PM. We are also at the Refreshed Farmer’s Market which is in the Refresh building on Broad Street on Mondays from 4:00 PM to 7:00 PM. It’s in the lobby in front of the Whole Foods Market. We also sell to a lot of local restaurants, so we pop up on menus every now and then at places like our own Café, Press Street Station, and the Sneaky Pickle on St. Claude. You’ll see us on a couple of random menus here and there. The “Starting your Fall Seeds Right” workshop will be held this Saturday, June 10th from 10AM to 12PM at the gardens and is free and open to the public. More information about Press Street Gardens can be found on their website at www.pressstreetgardens.com or on their Facebook page. This interview shortened and edited for clarity.